We have great news for National Grid customers. A Perfect Winter Electric Rate! Your new residential supply rate will be fixed at 10.77¢/kWh for 3 monthly bill cycles and will automatically move to 12.99¢/kWh fixed for 7 monthly bill cycles for a total term of 10 monthly bill cycles. After that, rates may vary based on your terms of service. *comparing electric supply-rates only. This does not include the charges from the utility to deliver power to your home. 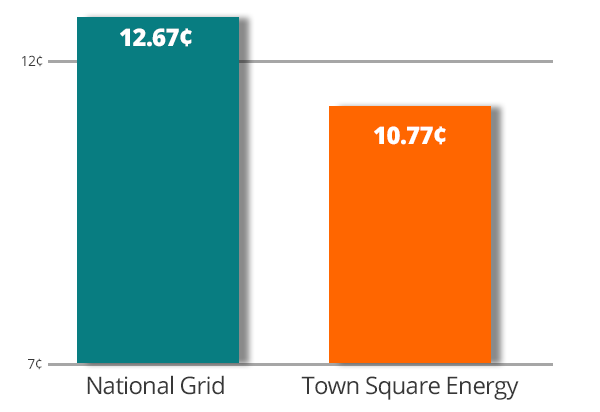 Comparison based on the current standard residential service supply-rate offered by National Grid of 12.67¢/kWh. This supply-rate offer is for National Grid customer’s living in Massachusetts.